CESENA, Italy — New figures released by the Global Wellness Institute reveal the staggering growth of the wellness industry, which is now valued at a whopping $4.2 trillion globally. According to the 2018 Global Wellness Economy Monitor, released this week, the all-new data on the ten markets that comprise the global wellness economy — from fitness and healthy eating to beauty and wellness tourism — provides fresh evidence that wellness remains one of the world’s biggest and fast-growing industries. “Once upon a time, our contact with wellness was occasional: we went to the gym or got a massage. But this is changing fast: a wellness mindset is starting to permeate the global consumer consciousness, affecting people’s daily decision-making – whether food purchases, a focus on mental wellness and reducing stress, incorporating movement into daily life, environmental consciousness, or their yearning for connection and happiness,” noted Katherine Johnston, senior research fellow, GWI. “Wellness, for more people, is evolving from rarely to daily, from episodic to essential, from a luxury to a dominant lifestyle value. And that profound shift is driving powerful growth,” she added. 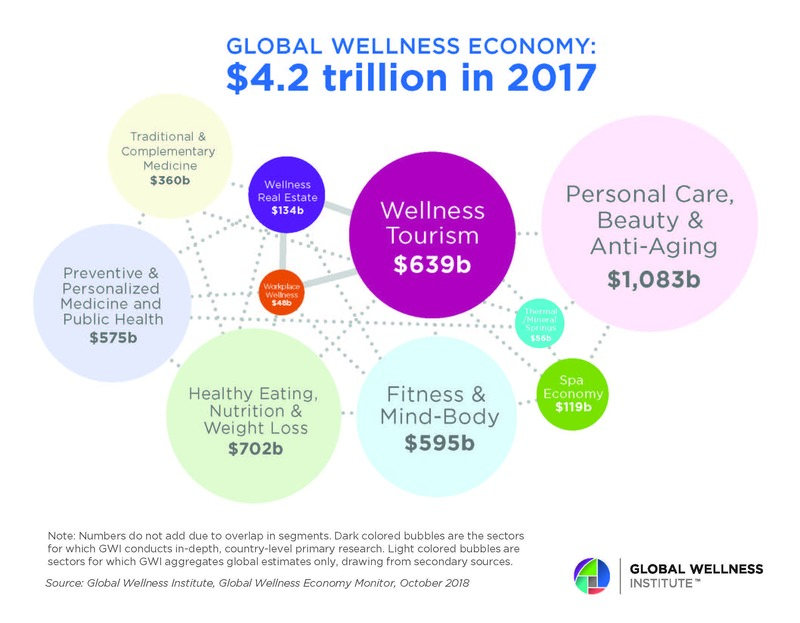 Rising by 12.8% from 2015-2017, the wellness economy has grown at nearly twice the rate of global economic growth (3.6%), and now represents 5.3% of all global economic output. Among the ten wellness markets analysed, revenue growth leaders from 2015-2017 (per annum) were the spa industry at 9.8%, wellness tourism at 6.5% and wellness real estate at 6.4%, with the personal care and beauty and healthy eating, nutrition and weight loss categories representing the highest output. At $639 billion, the fast-growing wellness tourism segment shows no signs of slowing. According to the report, travellers made 830 million wellness trips in 2017, which is 139 million more than in 2015, with Asia making the most gains in the number of wellness trips and wellness tourism expenditures. 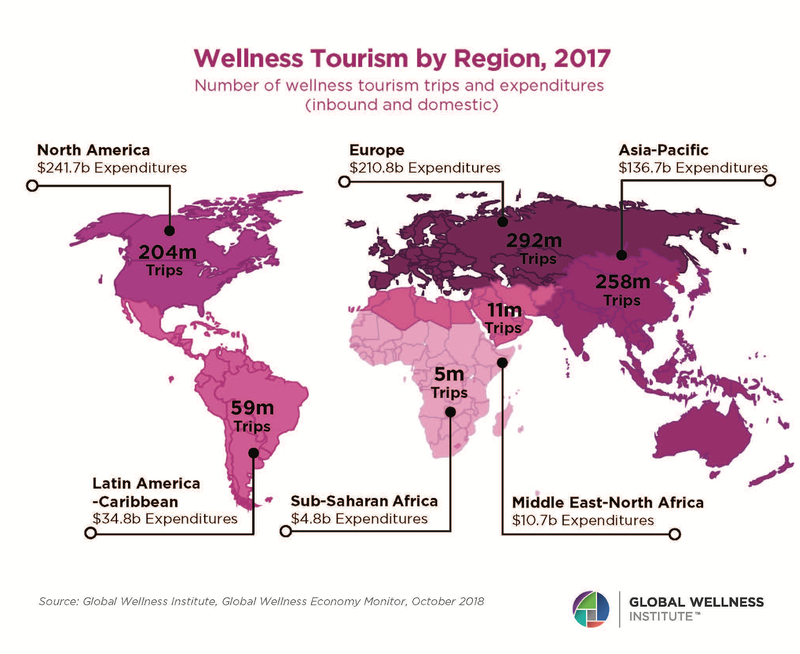 Elsewhere, the GWI estimates that the global wellness real estate sector is now worth $134 billion, this the report argues is thanks to rising consumer interest in extending wellness experiences from vacation destinations and leisure activities into the homes and everyday experiences. 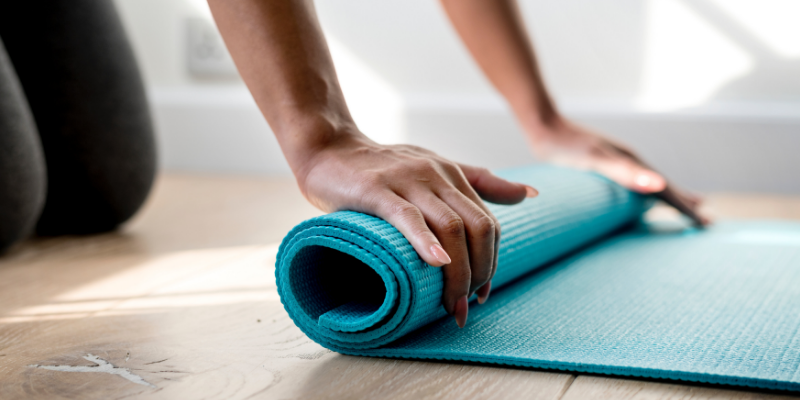 “In the face of longer lifespans, and rising chronic disease, stress and unhappiness, we only see growth for wellness ahead,” commented Ophelia Yeung, senior research fellow, GWI. By focusing on the “we” of wellness it argues that it will create a winning value proposition not only for customers but for employees, investors, and other stakeholders.